Workflow is a rules-based system that automatically sends an email notification, creates a task, performs an action, or starts a proof when specific, user-defined events occur. Workflow is available in the Files & Discussions and Database tabs and can only be accessed by a Workspace Administrator. Workflows will trigger in the order of the displayed priority on your workflow list. Apply the rule to a folder. Hold the Ctrl key to select multiple folders. Select the various Notification options or Action settings depending on your Rule Type. (Optional) Customize the Email Template or Task Details using the available workflow variables. To insert a workflow variable, select a variable from the drop-down menu and click Insert into Template. To deactivate a workflow rule, edit the rule, select Inactive, and click Save Workflow Rule. 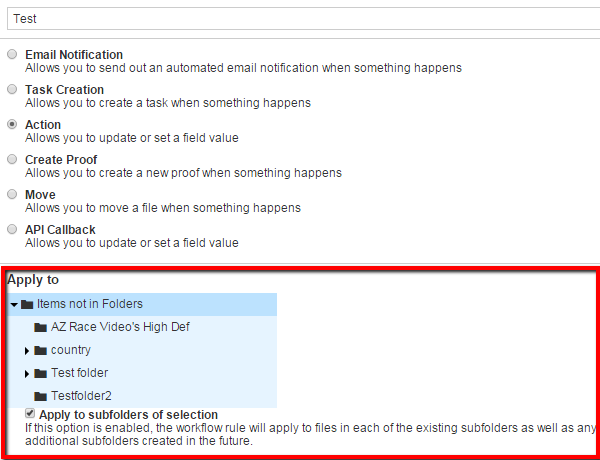 To select all the subfolders and files of a top level folder to include in a workflow rule, simply check the check box next to "Apply to subfolders of selection". To select individual folders, uncheck that checkbox and manually click on the folders you would like to include in your workflow rule. Files & Discussion workflow rules can be deleted by clicking the 'trash can' icon to the left of rules in the Files & Discussion workflow rule list.